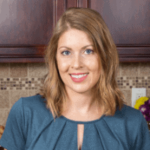 Published: Mar 11, 2015 · Modified: Mar 11, 2019 · By Jen Sobjack · This post may contain affiliate links. 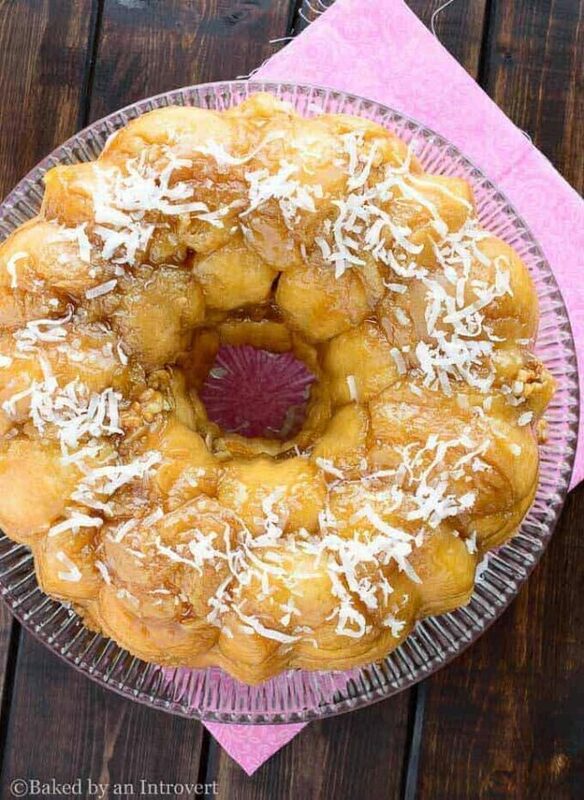 This Tropical Monkey Bread is a classic monkey bread that is given a tropical twist with coconut milk, pineapple, walnuts, and shredded coconut. And it is made completely from scratch! After making blueberry stuffed pull-apart bread I couldn’t stop thinking of other fun ways to jazz up a monkey bread. Who loves monkey bread? I know I do. I’ve even made a slow cooker monkey bread! I haven’t met a person who doesn’t love a good old fashioned sticky, gooey pull-apart bread. It makes a great breakfast or dessert. I think we can all agree that dessert for breakfast is a win. The concept of a monkey bread is it’s basically one giant mound of cinnamon rolls that are meant to be torn apart one roll at a time. How fun and delicious does that sound? I’ve seen so many different variations of it. Stuffed with strawberries, stuffed with cream cheese, and other countless add-ins. But what I hadn’t seen is a tropical version layered with pineapple, walnuts, and coconut. The dough is made completely from scratch. And instead of using milk in the dough I used light coconut milk. I can’t even begin to explain how incredible this made the bread taste. Think of a breakfast Danish. It’s very similar to that! It’s important to use a quality yeast when making any type of yeast dough. My all-time favorite yeast is Red Star and it’s what I use in all of my baking. The dough is rolled into balls and coated with butter and cinnamon sugar. The dough then gets layered in a bundt pan with crushed pineapple, shredded coconut, and walnuts. All of the rolls you pull off will be sweet, sticky, pinapple-y, coconut-y, and finger licking good. You will reach for bite after bite. 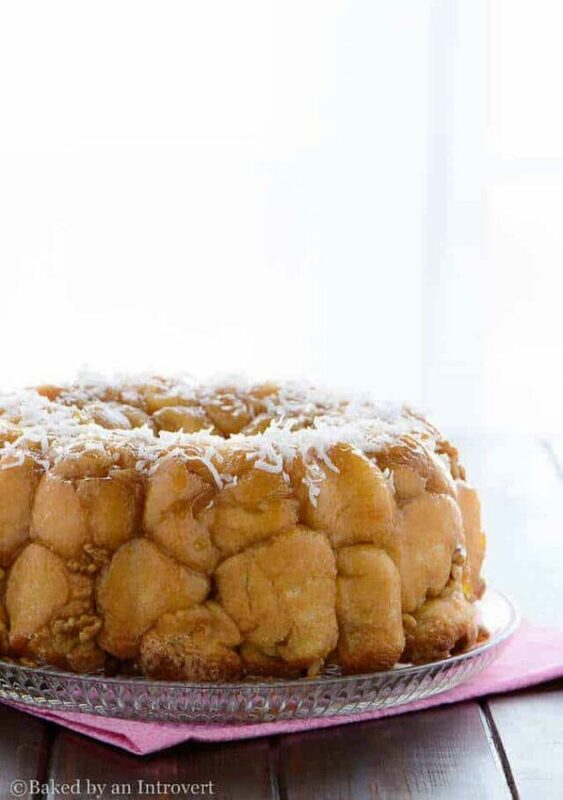 Think of a tropical island rolled up into the best monkey bread you’ve ever tasted. This monkey bread is just that. It’s a summer vacation in a bundt pan. Homemade monkey does take a little bit of time to prepare but trust me when I say that from scratch versions are way better than any shortcut versions. You will smell this gooey, tropical paradise bubbling away in your oven and you will thank me. For more deliciously sweet breakfast recipes, try these baked brown butter beignets with orange brown butter glaze and this apple cider coffee cake. 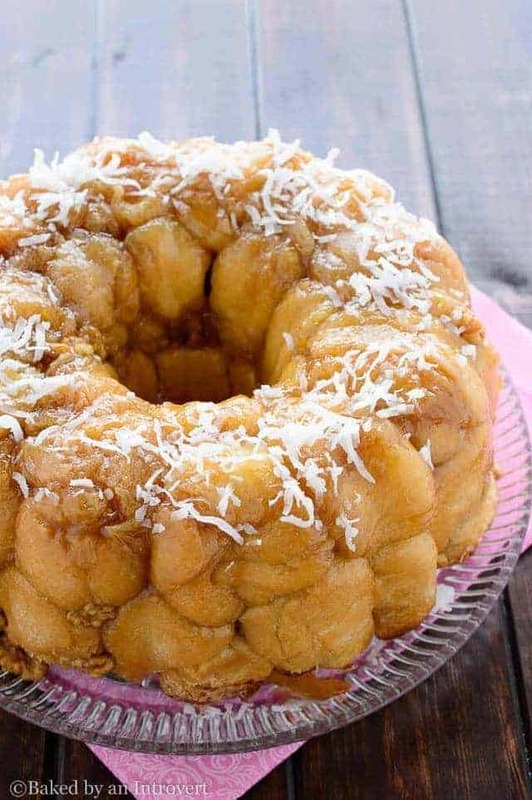 A classic monkey bread is given a tropical twist with coconut milk, pineapple, walnuts, and shredded coconut. And it is made completely from scratch! In a small cup, combine the yeast, warm water, and 1 tablespoon of the sugar. Stir to dissolve; let sit for 5 minutes. In a large mixing bowl, combine the yeast mixture, coconut milk, remaining sugar, eggs, salt, and 2 cups of flour. Mix until well blended and smooth. Gradually add in enough of the remaining flour to make a stiff dough. Turn the dough out onto a lightly floured surface and knead until smooth and elastic, about 6 to 8 minutes. The dough is ready when it springs back when poked with a finger. Place the dough in a greased bowl, cover, and let rise in a warm place until it doubles in size (about 1 hour). Meanwhile, melt the butter for the coating in a small bowl. Stir in the coconut milk. In a separate bowl combine the white sugar and brown sugar. Set aside. Spray a 10 cup bundt pan with cooking spray. Set aside. Punch the dough down gently. Let rest for 10 minutes. Pinch off 2 Tbs of dough and shape it into a ball. Dip the ball into the melted butter mixture then generously roll it into the sugar coating. Arrange the dough ball seam side down in the prepared bundt pan. Once the bottom of the pan is covered, top with half of the pineapples, coconut, and walnuts. Layer another layer of dough over top. Top with remaining pineapple, coconut, and walnuts. Top with remaining dough. Pour the remaining over butter over the exposed dough. Cover and let rise for 30 minutes. Preheat the oven to 350ºF degrees. Bake for 30-35 minutes. Cool in the pan for 10 minutes. Invert the bread onto a plate. Sprinkle with sweetened coconut. Serve warm. I have never made monkey bread before, but this recipe has convinced me I need to change that soon! Thank you, Oana! It definitely is the perfect excuse for dessert at breakfast! holy shiiiiii* this looks so tasty! I’m totally thinking of making something similar to this soon! Yours looks amazing! Ooohh! I can’t wait to see it! That looks fantastic Jen! I love breakfast sweet breads, so fun and so good! Definitely need to try this version! This looks amazing! I can;t wait to try it! Okay, I seriously need to get a bundt pan now!! This looks so delicious, I love all of the fun tropical flavors!! BEAUTIFUL photos and bread! And I love those flavors. I have full-blown tropical flavor brain lately with spring around the corner! That looks divine! If eating this makes me feel like I’m on a beach somewhere with a pina colada in one hand an a margarita in the other…I am IN. Love this tropical infusion! This is such a unique twist on monkey bread. I love how you were thinking outside of the box on this one! 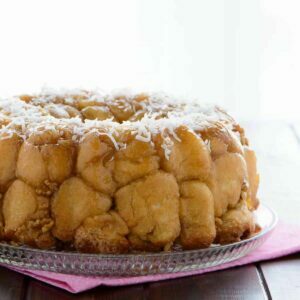 Tropical monkey bread!!!! drooling looking at the pictures, Jen! Would love to try this twist sometime! The coconut I expected, but not the coconut milk! SO clever and just a perfect way to add that extra punch of flavor 🙂 Yum! This is just too fun, Jen! Those tropical flavors! Ahh, I can’t wait for spring! Pinning for later! This monkey bread is gorgeous, Jen! The texture is just perfect and I absolutely love the tropical flavors! So creative and your photos are stunning! This is so pretty Jen! Love the tropical flavors, beautiful pictures too! Pinned. I think you will really enjoy this, Christina. Thank you for reading! Oh my gosh Jen, this is off the charts! That pineapple/coconut/walnut combo sounds absolutely perfect. Forget the weekend, hump day needs this asap! Haha! I hear you, Mary. Anytime is a good time for monkey bread. Thank you so much for stopping by! Wow, your version of monkey bread is so amazing! It’s pretty, too. I only got into monkey bread as an adult, and now you’re giving me even more options to enjoy it! Monkey bread is always a favorite in my house. I just love the tropical flavors here!! Monkey bread – so exciting! Love the flavors! Beautiful pictures! Yay for joining the monkey bread club! I think you will really like this version, Erin. Holy cow, this bread is so freakin’ creative and unbelievably GORGEOUS! It seems like all I’m craving these days are tropical things + carbs so this is right up my alley! And I love your photos so much Jen! The lighting is so soft and gorgeous! Monkey bread is one of those dishes that I totally love, yet never make! This tropical version sounds delicious, Jen! I love your creativity! And so perfect for the warmer weather headed our way, too. Pinned! The tropical version is the best one yet! Thank you so much, Gayle.